So more cooking and cleaning than anything else. No, really; you should make this. It's amazing. It suddenly occurred to me late last week - hey, I got that navy Encore Worsted last year to make the little one a sweater, and, well, it's unusually cold down here this fall. So I'm doing Nanna again. 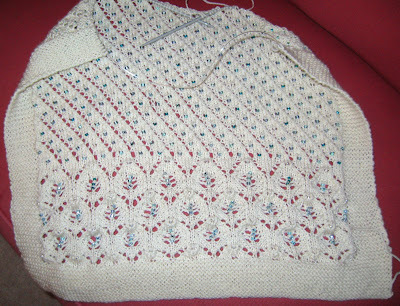 It's a lovely little pattern and it's going pretty quickly. Hopefully he'll like it and it won't itch. But he's like his dad and they both run hot, not like me, so we'll see. 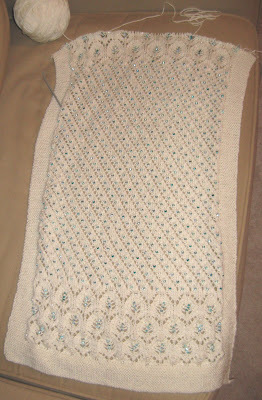 I've also had a breakthrough with Ravelry - they now let you load pictures directly from your own source, so I don't have to load the pictures to a Flickr account, then to Ravelry, which really kind of made that site more work than I was motivated to put in. As a librarian, I deal with social networking software some (and have to listen to people discuss it far more [in fact, if you know certain things about me, stringtheory2.0 makes a lot of sense]) but for the most part it doesn't do much for me. Maybe it focuses too much on the social for me. I like Ravelry for all the combined brainpower; the way all kinds of patterns and yarns are cataloged in there. Anyway, they've made it easier for my lazy self to make use of it. Yay! Slow progress (though last night I really got on a role while watching the football game, I think skipping working out helped but holiday season is not the time to start skipping working out) I made it to the halfway point last night. I'm now on the second 440 yd. ball and just have to mirror back. I think I'll have the diagonal go the opposite way for interest on the other side. And no, I'm not going to match the bead placement on the other side. Threading on all these beads takes enough time without getting that OCD, thanks anyhow. To ensure a match on the far side (just on the flower part) I counted out the right number of white and dark aqua beads and set them aside in a little baggie (inside of the big baggie all this crap lives in - such an attractive addition to any living room, plastic bags full of yarn and tubes of beads) so the two edges would be exactly the same. So far this is my favorite of my beaded attempts. I think using multiple colors is what makes it so fun. The white/clear ones are from my friend Elsie and her daughter Stina who were in upstate NY and were kind enough to try and help me find the right beads for this project. I'd already fallen in love with the tanzanite and aqua but these white sort of pull the whole thing together. I'm including this close up, but I really need a shot outside, the flash washes these out too much. Well, if you click on it you can see it better I guess. But it looks all misshapen, 'cause it needs to be blocked. 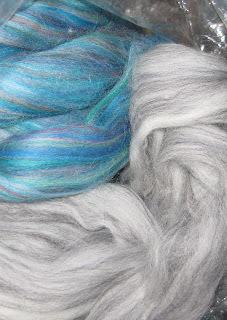 So, you can see from the pictures of the fleece that the colors are really lovely. They are - I love them. I loved spinning them. 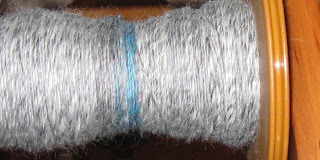 Plied together, not so much. I need to rethink this one. I might like it better knit up. I guess I need to confront my dislike of high contrast marled yarn. Even if it's of my own design. It looks more teal here than it really is - it's more green in real life. Bobbin #1 is all the Mountain Teal and the second bobbin is gray with a little bit of teal spliced in. I'll post a picture once I get some plied, which should be interesting. So, at home today, waiting for roofers. I pulled out the sewing machine to fix some hems. I also pulled out the leftover fleece from the Halloween costume this year to make a knitting bag. It's based loosely on a messenger bag design, and I made 2 smaller bag inside for sticking scissors etc., in. I made it out of fleece because I get tired of bags being so rough they make my yarn pill before I even knit with it. When working on something complicated, like a Fassett sweater, I used to use an old pillowcase to bring it with me, but that's inconvenient (no handles or compartments) and kind of makes you look, well, insane, actually. Boy, is this thing ugly! Maybe if I had picked out colors I wanted to use instead of using up leftovers . . . I dunno. But's very soft and I think would look like more with a real project in it. I kind of want to crawl into it myself. Other things to do today - making pizza and finishing plying that Gotland. 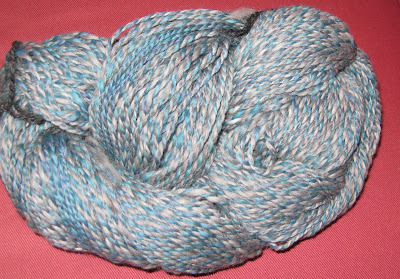 So, I'm nearly done spinning the pound of Gotland; I should finish tonight and ply it. It's been a nice companion while watching CNN way too late into the night. 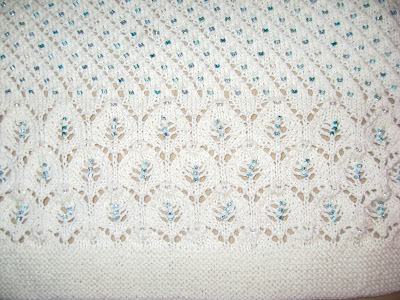 And here's the Frost Flowers shawl - if you click on it to look at the image more closely, you can see the colors of the beads better. Ever tried to place/space stuff like this randomly? I'm firmly convinced human brains don't do random. Take a look at the darker green and white beads, am I achieving random? Not really. But it's coming out the way I imagined, and that happens rarely enough that I'm enjoying it. Here's some lovely chocolate alpaca from Yarn or Death . I've plied it with itself, and plied it with some multi color roving from Zeilinger. 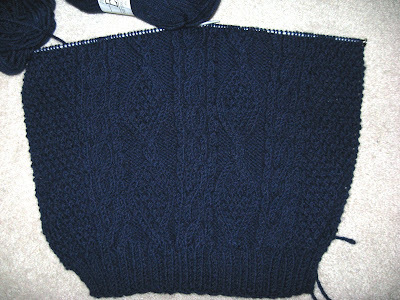 But, until she gets to see it and come down with a verdict, I'm going to work on the final pound of Gotland. I sent the spun Gotland to my mother see if she wanted it and it was promptly appropriated. But 2 lb. wasn't enough. Then I'll start on the grey and green.